Just recently, I’ve started hearing a lot about duck eggs. It started with reading an article about a recipe for a Cardamom Cake with Rhubarb Sauce (delicious) where the author mentioned her duck egg source – who happens to live in my same town. Dave Griffin has a beautiful spot just outside of town where he’s raising Indian Runner Ducks, then collects and sells the eggs. We went out to the farm and were lucky enough to get the full tour. 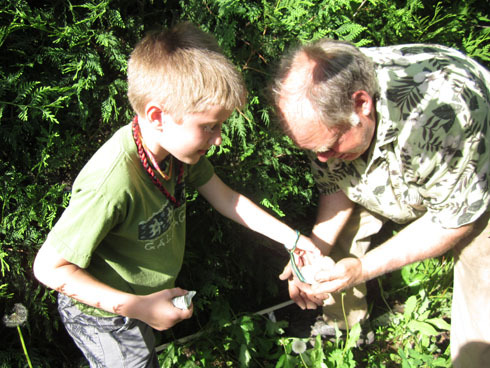 We started by searching for our own eggs. 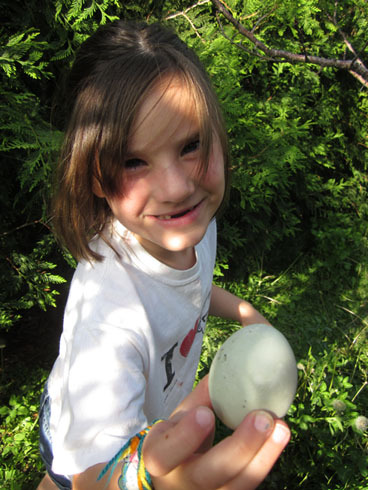 The kids found eggs tucked into little shady spots along paths and trees throughout the farm. When looking for eggs, being short has some definite advantages. 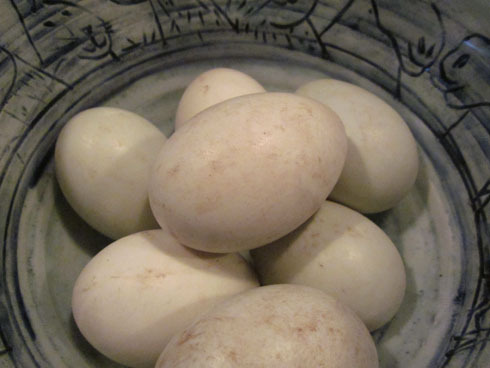 The duck eggs are darker in color, have a harder shell, and are bigger than chicken eggs. Also, the yolks are much bigger. Dave explained that they will keep for three weeks on the countertop, as long as we don’t wash them until ready for use. 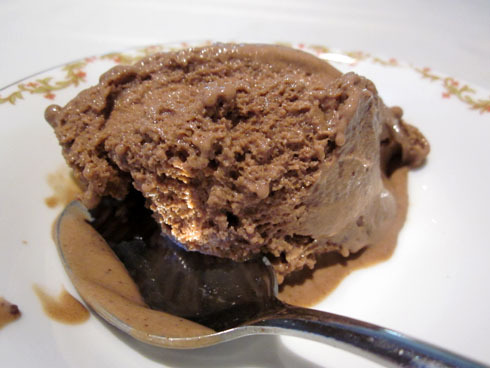 Known for their ability to make foods extra creamy, we decided to put the duck eggs to use by making a non-dairy chocolate gelato. One of the tricky parts about making non-dairy ice cream is trying to find a way to emulate the thick, creamy goodness that comes naturally when you use dairy products. Although soy substitutes work well for us, we had yet to achieve the creaminess we wanted. Turns out, duck eggs were just what we needed. Over medium high heat, bring creamer and soy milk to a boil. Remove from heat. In a bowl, beat egg yolks then add sugar, beating until they are creamer and lighter in color. Add 2 T. of the hot milk and continue to beat until well combined. Add remaining hot milk and beat until lighter in color and texture. Place milk mixture in the top of a double boiler. Stirring often, cook until it has thickened and leaves a thick coating on the back of a spoon. Add chocolate chips and stir until melted and well combined. Remove from heat, allow to cool for 10 minutes, then place in the refrigerator for an hour or two. Using manufacturer’s instructions add to an ice cream machine and cool until it turns into ice cream. Place in container and freeze until ready to eat. When ready to serve, remove from freezer about 10 minutes before serving. Notes: It is extremely important to make sure that no egg whites get into the mixture. If you see any floating to the surface during the process, simply skim to remove. I was lucky enough to taste this. It was absolutely delicious! It look delicious, but the search for eggs looked even better. Great photos, Jennie. Your new digs look great! Putting you in my reader.